Thanks to requests from the community, the developers of Vector 36 have ported their futuristic physics-based racer set on Mars to Linux! You can see their announcement here. It's an early port, and the game itself is in Early Access so it will have bugs. I have requested a key, so hopefully I can give you some more thoughts on it soon. It has everything in a game that appeals to me directly. I love racing games, I love future sci-fi and I like to tinker with my racer! 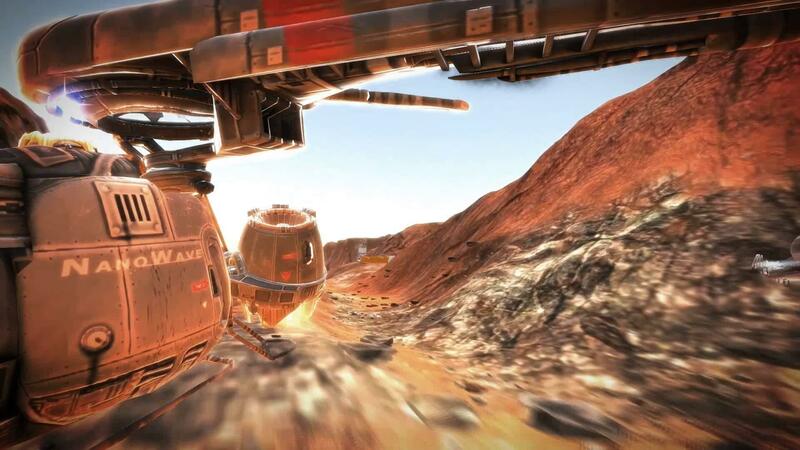 Race other pilots through various tracks on Mars. Compete in Sprint, Circuit, or Tournament modes to win credits, parts, or new Skimmers. It is super hard! But I look forward to testing it more later. Looks cool. I'll check it out when it's fully released. Cool! Reminds me of Star Wars Racer. nothing special, perhaps there is a magic with VR. Not bad. I hope it will come out DRM-free. I bought it instantly and just as soon found out that it does not work on my linux at all...but the dev is really forthcoming and is working on the issues! I bought it last week and played it to the death the last days - loving it! the handling - I mean physics - is great, especially if you like F Zero ( GX ), WipeOut and the rest, but always figured that there should be more depth to the controls. it's deep! and steep. to learn, that is. best thing for me is that I'm able to completely change the setup = handling of my racer, endless tinkering ensured. you start out with a fairly slow machine and then upgrade your way up to go more than twice as fast later on, but doe to the complex handling it doesn't get boring with the low tier machines after you moved up, it's still fun to race and tweak a slow skimmer to its max potential, which is a big achievement for a racer. for me it's almost the perfect game, SF setting, speed, depth, it's all there. the Dev is really supportive and reacted immediately after I posted on the steam boards to check and work out a few bugs, really great. this makes me very optimistic about further development and support of this game (which is great for me as it is right now).